Can Faith’s tiny tone traveller deliver? A fine choice of travel guitar, but not quite on the level of the all-mahogany version. Lovely build quality and all-solid construction. Naturally, it’s what’s on the inside that counts though and this guitar makes a strong impression on first inspection. As the names suggest, the Mini-Saturn is based on Faith’s dreadnought design. At 590mm in scale length (compared to 650mm for a full-size model), the it is noticeably smaller but not so much as to drastically alter the playing experience, striking a good balance that allows Faith to retain proper string tension. As you can probably tell from the photography, the Saturn pairs a mahogany back and sides with a spruce top. It sports a nicely applied satin finish and, like many travel guitars, lacks any binding. The Fingerboard is Indonesian rosewood and the bridge figured Macassan ebony. Faith has built an enviable reputation based on incredible value for money thanks to all-solid construction and designs by renowned luthier Patrick James Eggle. It’s clear that this guitar has been designed with a great deal of care and attention. It is not a novelty item - it’s a serious instrument that match its full-scale designs as closely as possible while packing in some smart features and retaining that same level of build quality we’ve come to expect from Faith. 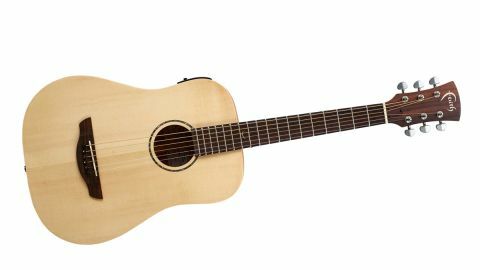 The all-solid construction seems to have done less for the depth of the tones on offer in comparison with the recently reviewed Mini-Neptune, and to our ears the spruce makes the guitar sound harsher in the trebles and more boxy than its counterpart. Again, fingerpicking softens this somewhat and makes the tones more evenly balanced, but still not on a par with the all-mahogany version. Flatpicking was especially harsh, and if you wanted to go down this route we think you’d need to pick your pick carefully so as to coax the best out of the guitar. Faith has included its own proprietary CnR-3 system, which, for such a small unit, packs in a surprising amount of features. Plugged in, the EQ helps to balance out any aspects of the tone not to your liking for a more rounded performance. We never expected top-shelf performance from a small, bespoke unit - but the CnR-3 does an admirable job, translating a superb acoustic performance into a decent electro one, particularly with a few choice effects to deepen the tones. The value for money is top notch, too - it’s just a shame that the Mini-Saturn’s tones aren’t quite on the level of the aforementioned Mini-Neptune. If we were to personally pick between the two it would be an easy choice, but as always, it’s worth checking both out to make sure that the tonal palette fits with your style of playing before committing.